This name uses Eastern Slavic naming customs; the patronymic is Yevgenyevich and the family name is Karpov. Anatoly Yevgenyevich Karpov (Russian: Анато́лий Евге́ньевич Ка́рпов; born May 23, 1951) is a Russian chess grandmaster and former World Champion. He was the official world champion from 1975 to 1985 when he was defeated by Garry Kasparov. He played three matches against Kasparov for the title from 1986 to 1990, before becoming FIDE World Champion once again after Kasparov broke away from FIDE in 1993. He held the title until 1999, when he resigned his title in protest against FIDE's new world championship rules. For his decades-long standing among the world's elite, many consider Karpov one of the greatest players in history. His tournament successes include over 160 first-place finishes. He had a peak Elo rating of 2780, and his 102 total months at world number one is the third longest of all time, behind Magnus Carlsen and Garry Kasparov, since the inception of the FIDE ranking list in 1970. Karpov was born on May 23, 1951, in Zlatoust in the Urals region of the former Soviet Union, and learned to play chess at the age of 4. His early rise in chess was swift, as he became a Candidate Master by age 11. At 12, he was accepted into Mikhail Botvinnik's prestigious chess school, though Botvinnik made the following remark about the young Karpov: "The boy does not have a clue about chess, and there's no future at all for him in this profession." Karpov acknowledged that his understanding of chess theory was very confused at that time, and later wrote that the homework Botvinnik assigned greatly helped him, since it required that he consult chess books and work diligently. Karpov improved so quickly under Botvinnik's tutelage that he became the youngest Soviet National Master in history at fifteen in 1966; this tied the record established by Boris Spassky in 1952. Karpov finished first in his first international tournament in Třinec several months later, ahead of Viktor Kupreichik. In 1967, he won the annual European Junior Championship at Groningen. Karpov won a gold medal for academic excellence in high school, and entered Moscow State University in 1968 to study mathematics. He later transferred to Leningrad State University, eventually graduating from there in economics. One reason for the transfer was to be closer to his coach, grandmaster Semyon Furman, who lived in Leningrad. In his writings, Karpov credits Furman as a major influence on his development as a world-class player. 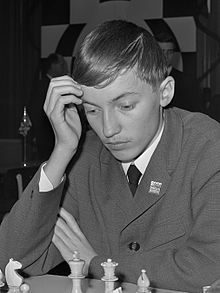 In 1969, Karpov became the first Soviet player since Spassky (1955) to win the World Junior Chess Championship, scoring an undefeated 10/11 in the finals at Stockholm. In 1970, he tied for fourth place at an international tournament in Caracas, Venezuela, and was awarded the grandmaster title. He won the 1971 Alekhine Memorial in Moscow (equal with Leonid Stein), ahead of a star-studded field, for his first significant adult victory. His Elo rating shot from 2540 in 1971 to 2660 in 1973, when he shared second in the USSR Chess Championship, and finished equal first with Viktor Korchnoi in the Leningrad Interzonal Tournament. The latter success qualified him for the 1974 Candidates Matches, which would determine the challenger to the reigning world champion, Bobby Fischer. Karpov defeated Lev Polugaevsky by the score of +3=5 in the first Candidates' match, earning the right to face former champion Boris Spassky in the semifinal round. Karpov was on record saying that he believed Spassky would easily beat him and win the Candidates' cycle to face Fischer, and that he (Karpov) would win the following Candidates' cycle in 1977. Spassky won the first game as Black in good style, but tenacious, aggressive play from Karpov secured him overall victory by +4−1=6. The Candidates' final was played in Moscow with Korchnoi. Karpov took an early lead, winning the second game against the Sicilian Dragon, then scoring another victory in the sixth game. Following ten consecutive draws, Korchnoi threw away a winning position in the seventeenth game to give Karpov a 3–0 lead. In game 19, Korchnoi succeeded in winning a long endgame, then notched a speedy victory after a blunder by Karpov two games later. Three more draws, the last agreed by Karpov in a clearly better position, closed the match, as he thus prevailed +3−2=19, moving on to challenge Fischer for the world title. Though a world championship match between Karpov and Fischer was highly anticipated, those hopes were never realised. Fischer not only insisted that the match be the first to ten wins (draws not counting), but also that the champion retain the crown if the score was tied 9–9. FIDE, the International Chess Federation, refused to allow this proviso, and after Fischer's resignation of the championship on June 27, 1975, FIDE declared that Fischer forfeited his crown. Karpov later attempted to set up another match with Fischer, but the negotiations fell through. This thrust the young Karpov into the role of World Champion without having faced the reigning champion. Garry Kasparov argued that Karpov would have had good chances, because he had beaten Spassky convincingly and was a new breed of tough professional, and indeed had higher quality games, while Fischer had been inactive for three years. Spassky thought that Fischer would have won in 1975 but Karpov would have qualified again and beaten Fischer in 1978. Determined to prove himself a legitimate champion, Karpov participated in nearly every major tournament for the next ten years. He convincingly won the very strong Milan tournament in 1975, and captured his first of three Soviet titles in 1976. He created a phenomenal streak of tournament wins against the strongest players in the world. Karpov held the record for most consecutive tournament victories (9) until it was shattered by Garry Kasparov (14). As a result, most chess professionals soon agreed that Karpov was a legitimate world champion. In 1978, Karpov's first title defence was against Korchnoi, the opponent he had defeated in the 1973–75 Candidates' cycle; the match was played at Baguio, Philippines, with the winner needing six victories. As in 1974, Karpov took an early lead, winning the eighth game after seven draws to open the match. When the score was +5−2=20 in Karpov's favour, Korchnoi staged a comeback, and won three of the next four games to draw level with Karpov. Karpov then won the very next game to retain the title (+6−5=21). Three years later Korchnoi reemerged as the Candidates' winner against German finalist Robert Hübner to challenge Karpov in Merano, Italy. Karpov handily won this match, 11–7 (+6−2=10), in what is remembered as the "Massacre in Merano". Karpov's tournament career reached a peak at the Montreal "Tournament of Stars" tournament in 1979, where he finished joint first (+7−1=10) with Mikhail Tal ahead of a field of strong grandmasters completed by Jan Timman, Ljubomir Ljubojević, Boris Spassky, Vlastimil Hort, Lajos Portisch, Hübner, Bent Larsen and Lubomir Kavalek. He dominated Las Palmas 1977 with 13½/15. He also won the prestigious Bugojno tournament in 1978 (shared), 1980 and 1986, the Linares tournament in 1981 (shared with Larry Christiansen) and 1994, the Tilburg tournament in 1977, 1979, 1980, 1982, and 1983, and the Soviet Championship in 1976, 1983, and 1988. Karpov represented the Soviet Union at six Chess Olympiads, in all of which the USSR won the team gold medal. He played first reserve at Skopje 1972, winning the board prize with 13/15. At Nice 1974, he advanced to board one and again won the board prize with 12/14. At La Valletta 1980, he was again board one and scored 9/12. At Lucerne 1982, he scored 6½/8 on board one. At Dubai 1986, he scored 6/9 on board two. His last was Thessaloniki 1988, where on board two he scored 8/10. In Olympiad play, Karpov lost only two games out of 68 played. To illustrate Karpov's dominance over his peers as champion, his score was +11−2=20 versus Spassky, +5=12 versus Robert Hübner, +6−1=16 versus Ulf Andersson, +3−1=10 versus Vasily Smyslov, +1=16 versus Mikhail Tal, and +10−2=13 versus Ljubojević. Karpov had cemented his position as the world's best player and world champion by the time Garry Kasparov arrived on the scene. In their first match, the World Chess Championship 1984 in Moscow, the first player to win six games would win the match. Karpov built a 4–0 lead after nine games. The next 17 games were drawn, setting a record for world title matches, and it took Karpov until game 27 to gain his fifth win. In game 31, Karpov had a winning position but failed to take advantage and settled for a draw. He lost the next game, after which 14 more draws ensued. Karpov held a solidly winning position in Game 41, but again blundered and had to settle for a draw. After Kasparov won games 47 and 48, FIDE President Florencio Campomanes unilaterally terminated the match, citing the players' health. The match had lasted an unprecedented five months, with five wins for Karpov, three for Kasparov, and 40 draws. A rematch was set for later in 1985, also in Moscow. The events of the so-called Marathon Match forced FIDE to return to the previous format, with a match limited to 24 games (with Karpov remaining champion if the match finished 12–12). Karpov needed to win the final game to draw the match and retain his title, but lost, surrendering the title to his opponent. The final score was 13–11 (+3−5=16) in favour of Kasparov. Karpov remained a formidable opponent (and the world No. 2) until the early 1990s. He fought Kasparov in three more world championship matches in 1986 (held in London and Leningrad), 1987 (in Seville), and 1990 (in New York City and Lyon). All three matches were extremely close: the scores were 11½–12½ (+4−5=15), 12–12 (+4−4=16), and 11½–12½ (+3−4=17). In all three matches, Karpov had winning chances up to the very last games. In particular, the 1987 Seville match featured an astonishing blunder by Kasparov in the 23rd game. In the final game, needing only a draw to win the title, Karpov cracked under time pressure at the end of the first session of play, missed a variation leading to an almost forced draw, and allowed Kasparov to adjourn the game with an extra pawn. After a further mistake in the second session, Karpov was slowly ground down and resigned on move 64, ending the match and allowing Kasparov to keep the title. In their five world championship matches, Karpov scored 19 wins, 21 losses, and 104 draws in 144 games. Karpov is on record saying that if he had had the opportunity to play Fischer for the crown in his twenties, he could have been a much better player as a result. In 1992, Karpov lost a Candidates Match against Nigel Short. But in 1993, Karpov reacquired the FIDE World Champion title when Kasparov and Short split from FIDE. Karpov defeated Timman – the loser of the Candidates' final against Short. The next major meeting of Kasparov and Karpov was the 1994 Linares chess tournament. The field, in eventual finishing order, was Karpov, Kasparov, Shirov, Bareev, Kramnik, Lautier, Anand, Kamsky, Topalov, Ivanchuk, Gelfand, Illescas, Judit Polgár, and Beliavsky; with an average Elo rating of 2685, the highest ever at that time. Impressed by the strength of the tournament, Kasparov had said several days before the tournament that the winner could rightly be called the world champion of tournaments. Perhaps spurred on by this comment, Karpov played the best tournament of his life. He was undefeated and earned 11 points out of 13 (the best world-class tournament winning percentage since Alekhine won San Remo in 1930), finishing 2½ points ahead of second-place Kasparov and Shirov. Many of his wins were spectacular (in particular, his win over Topalov is considered possibly the finest of his career). This performance against the best players in the world put his Elo rating tournament performance at 2985, the highest performance rating of any player in history up until 2009, when Magnus Carlsen won the category XXI Pearl Spring chess tournament with a performance of 3002. Chess statistician Jeff Sonas considers Karpov's Linares performance the best tournament result in history. Karpov defended his FIDE title against Gata Kamsky (+6−3=9) in 1996. In 1998, FIDE largely scrapped the old system of Candidates' Matches, instead having a large knockout event in which a large number of players contested short matches against each other over just a few weeks. In the first of these events, the FIDE World Chess Championship 1998, champion Karpov was seeded straight into the final, defeating Viswanathan Anand (+2−2=2, rapid tiebreak 2–0). In the subsequent cycle, the format was changed, with the champion having to qualify. Karpov refused to defend his title, and ceased to be FIDE World Champion after the FIDE World Chess Championship 1999. Karpov's outstanding classical tournament play has been seriously limited since 1997, since he prefers to be more involved in Russian politics. He had been a member of the Supreme Soviet Commission for Foreign Affairs and the President of the Soviet Peace Fund before the Soviet Union dissolved. In addition, he had been involved in several disputes with FIDE and became increasingly disillusioned with chess. In the September 2009 FIDE rating list, he dropped out of the world's Top 100 for the first time. Karpov usually limits his play to exhibition events, and has revamped his style to specialize in rapid chess. In 2002 he won a match against Kasparov, defeating him in a rapid time control match 2½–1½. In 2006, he tied for first with Kasparov in a blitz tournament, ahead of Korchnoi and Judit Polgár. Karpov and Kasparov played a mixed 12-game match from September 21–24, 2009, in Valencia, Spain. It consisted of four rapid (or semi rapid) and eight blitz games and took place exactly 25 years after the two players' legendary encounter at the World Chess Championship 1984. Kasparov won the match 9–3. Karpov played a match against Yasser Seirawan in 2012 in St. Louis, Missouri, an important center of the North American chess scene, winning 8–6 (+5−3=6). In November 2012, he won the Cap d'Agde rapid tournament that bears his name (Anatoly Karpov Trophy), beating Vassily Ivanchuk (ranked 9th in the October 2012 FIDE world rankings) in the final. Since 2005, he has been a member of the Public Chamber of Russia. He has recently involved himself in several humanitarian causes, such as advocating the use of iodised salt. On December 17, 2012, Karpov supported the law in the Russian Parliament banning adoption of Russian orphans by citizens of the US. Karpov expressed support of the annexation of Crimea by the Russian Federation, and accused Europe of trying to demonize Putin. In March 2010 Karpov announced that he would be a candidate for the presidency of FIDE. The election took place in September 2010 at the 39th Chess Olympiad. In May a fund-raising event took place in New York with the participation of his former rival Garry Kasparov and of Magnus Carlsen, both of whom supported his bid and campaigned for him. Also Nigel Short announced he supported Karpov's candidacy. However, on September 29, 2010, Kirsan Ilyumzhinov was reelected as President of FIDE, winning the election by 95 votes to 55. Let us say the game may be continued in two ways: one of them is a beautiful tactical blow that gives rise to variations that don't yield to precise calculations; the other is clear positional pressure that leads to an endgame with microscopic chances of victory.... I would choose [the latter] without thinking twice. If the opponent offers keen play I don't object; but in such cases I get less satisfaction, even if I win, than from a game conducted according to all the rules of strategy with its ruthless logic. Viktor Korchnoi vs. Anatoly Karpov, Moscow 1973 Karpov sacrifices a pawn for a strong center and queenside attack. Anatoly Karpov vs. Gyula Sax, Linares 1983 Karpov sacrifices for an attack that wins the game 20 moves later, after another spectacular sacrifice from Karpov and counter-sacrifice from Sax. It won the tournament's first brilliancy prize. This was not the first time Karpov used the sharp Keres Attack (6.g4) – see his win in Anatoly Karpov vs. Vlastimil Hort, Alekhine Memorial Tournament, Moscow 1971. Anatoly Karpov vs. Veselin Topalov, Linares 1994 This game features a sham sacrifice of two pieces, which Karpov regains with a forcing variation culminating in the win of an exchange with a technically won endgame. Karpov's extensive stamp collection of Belgian philately and Belgian Congo stamps and postal history covering mail from 1742 through 1980 was sold by David Feldman's auction company between December 2011 and 2012. He is also known to have a large chess stamp and chess book collections. His private chess library consists of over 9000 books. Medal "For outstanding contribution to the Collector business in Russia"
International Association of Chess Press, 9 times voted the best chess player of the year and awarded the "Chess Oscar"
Karpov has authored or co-authored several books, most of which have been translated into English. Karpov, Anatoly; Roshal, Alexander (1979). Chess Is My Life. Pergamon Press. ISBN 0-0802-3119-5. Karpov, Anatoly (1988). The Open Game in Action. Batsford. ISBN 978-0713460964. Karpov, Anatoly (1988). The Semi-Open Game in Action. Collier. ISBN 978-0020218012. Karpov, Anatoly (1990). The Closed Openings in Action. Collier/MacMillan. ISBN 978-0020339854. Karpov, Anatoly (1990). The Semi-Closed Openings in Action. Collier/MacMillan. ISBN 978-0020218050. Karpov, Anatoly (1992). Beating the Grünfeld. Batsford. ISBN 978-0-7134-6468-9. Karpov, Anatoly (2006). Caro-Kann Defence: Advance Variation and Gambit System. Batsford. ISBN 0-7134-9010-1. Karpov, Anatoly (2007). My Best Games. Edition Olms. ISBN 3-2830-1002-1. Karpov, Anatoly; Henley, Ron (2007). Elista Diaries: Karpov–Kamsky, Karpov–Anand, Anand Mexico City 2007 World Chess Championship Matches. Batsford. ISBN 0-923891-97-8. Karpov, Anatoly (2007). How To Play The English Opening. Batsford. ISBN 0-7134-9065-9. ^ van Reem, Eric (August 11, 2005). "Karpov, Kortchnoi win Unzicker Gala". ChessBase.com. Retrieved July 2, 2009. ^ However, in his 1994 book "My Best Games" Karpov says he played some 200 tournaments and matches, and won more than 100. ^ "Anatoly Karpov's Best Games". ^ Karpov, A. (1992). Karpov on Karpov: A Memoirs of a Chess World Champion. Atheneum. ISBN 0-689-12060-5. ^ "EU-ch U18 f-A 6768 1967 – 365Chess.com Tournaments". 365chess.com. Retrieved October 20, 2013. ^ "Wch U20 fin-A 1969 – 365Chess.com Tournaments". 365chess.com. Retrieved October 20, 2013. ^ "Caracas 1970 – 365Chess.com Tournaments". 365chess.com. Retrieved October 20, 2013. ^ In an article (PDF) published in 2004 on the Chesscafe website Susan Polgar wrote: "I spoke to Boris Spassky about this same issue and he believes that Bobby would have won in 1975, but that Anatoly would have won the rematch." ^ Seirawan, Yasser. Winning Chess Strategies. Microsoft Press. ISBN 978-1857443851. ^ Facts and figures: Magnus Carlsen's performance in Nanjing. ChessBase.com. Retrieved on 2009-10-26. ^ "The Credit Suisse Blitz – in pictures". ChessBase. August 27, 2006. Retrieved October 21, 2010. ^ "Kasparov and Karpov to play 12 games match in Valencia". Chessdom. Retrieved July 8, 2009. ^ "Karpov, Seirawan Head to Rapid Play in Saint Louis". St Louis Chess Club. Retrieved June 12, 2012. ^ "Stories from the region". www.unicef.org. Retrieved March 26, 2018. ^ "(2 чтение) ФЗ №186614-6 "О мерах воздействия на лиц, причастных к нарушению основополагающих прав и свобод человека, прав и свобод граждан РФ" – Система анализа результатов голосований на заседаниях Государственной Думы". vote.duma.gov.ru. Retrieved March 26, 2018. ^ Кожемякин, Владимир. "Анатолий Карпов: Европа пытается демонизировать Путина, а не Россию". www.aif.ru. Retrieved March 26, 2018. ^ "Big Karpov fund-raiser in New York". chessbase.com. May 18, 2010. Retrieved March 26, 2018. ^ "Kirsan Ilyumzhinov wins 2010 FIDE elections". Chessdom.com. 2010. ^ "Karpov the boa constrictor". The Guardian. September 7, 2010. Retrieved May 7, 2014. ^ Hooper, David; Whyld, Kenneth (1996). The Oxford Companion to Chess. Oxford: Oxford University Press. p. 192. ISBN 0192800493. Retrieved September 26, 2016. ^ "Belgium collection formed by Anatoly Karpov". David Feldman. 2011. Archived from the original on January 2, 2013. Retrieved October 12, 2011. ^ "Anatoly Karpov: The Owner of the Unique Stamp Collection". Watch-Clone.com. Archived from the original on February 18, 2011. Retrieved March 28, 2011. ^ "Kasparov – Karpov Valencia 2009, day 3 LIVE! - Chessdom". tournaments.chessdom.com. Retrieved March 26, 2018. ^ "Background of the tournament". 3rd Karpov International Chess Tournament official website. Retrieved August 28, 2015. Fine, Rueben (1983). The World's Great Chess Games. Dover. ISBN 0-486-24512-8. Hurst, Sarah (2002). Curse of Kirsan: Adventures in the Chess Underworld. Russell Enterprises. ISBN 978-1-88869-0-156. Károlyi, Tibor; Aplin, Nick (2007). "Endgame Virtuoso Anatoly Karpov". New in Chess. ISBN 978-90-5691-202-4. Karolyi, Tibor (2011). Karpov's Strategic Wins 1: The Making of a Champion 1961–1985. Quality Chess. ISBN 978-1-906552-41-1. Karolyi, Tibor (2011). Karpov's Strategic Wins 2: The Prime Years 1986–2009. Quality Chess. ISBN 978-1-906552-42-8. Karpov, Anatoly (2003). Anatoly Karpov's Best Games. Batsford. ISBN 0-7134-7843-8. Markland, Peter (1975). The Best of Karpov. Oxford University Press. ISBN 978-0-19-217534-2. Winter, Edward G., editor (1981).World Chess Champions. Pergamon Press. ISBN 0-08-024094-1. Wikimedia Commons has media related to Anatoly Karpov.